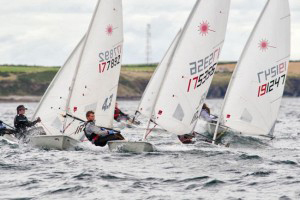 15 RCYC sailors headed North this weekend for the laser Ulsters and managed an impressive 7 top ten results across all three laser fleets in tough and demanding conditions. Nick Walsh took an impressive 4th and Edward Rice finished 10th overall in the Standard Class. In the Radial class we had Luke Mc Grath & Tara Coveney as well as Ronan Walsh in 5th place and Johnny Durcan in 3rd. Finally, a total of nine of our 4.7 sailors competed, including Maeve O’Sullivan, Patrick Daly, Molly Murphy, Caoimhe Foster, Amy Carroll & Cian Jones. The additional three all finished inside the the top ten; Micheal Carroll in 6th, Tom Keal in 8th and Paddy Cunnane in 9th. A special thanks to Ken Cunnane for letting us avail of his Rib to support all Royal cork sailors while they battled the elements. Thanks also to Michael Carroll who supported Ken on the Rib for the two days and kept our sailors fed and watered and carried out all emergency repairs as required. Well done to all our Sailors for doing so well in difficult conditions.